Associated with improvements for liver disease including cirrhosis. May help reduce insulin resistance. 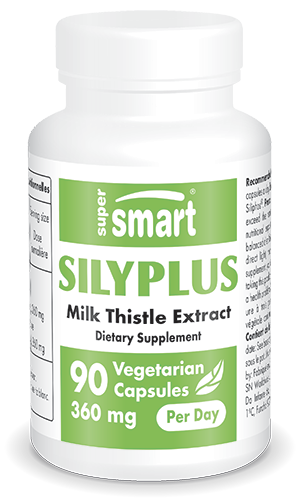 Our dietary supplement SilyPlus is formulated from milk thistle, also known as wild artichoke, silver milk thistle, blessed milk thistle or St. Mary's thistle. Found in abundance around the Mediterranean, milk thistle has been used for centuries for its beneficial effects on liver function. In particular, it’s believed to protect the liver against the development of hepatic diseases. As a result of its therapeutic use, it has been the subject of numerous scientific studies. At the end of the 1960s, a team of researchers identified silymarin as the compound responsible for milk thistle’s therapeutic properties. Silymarin is a flavonoid complex encompassing silybin, silydianin and silychristin. These compounds are known for their health-protecting antioxidant potency. Silymarin is present in all parts of the milk thistle plant but is particularly concentrated in its seeds when it reaches maturity. it inhibits synthesis of leukotrienes, exerting an anti-inflammatory effect. As a result of its antioxidant potency and liver-beneficial properties, silymarin is associated with improvements in liver diseases such as cirrhosis. Primarily linked to excessive alcohol consumption, this chronic liver disease is characterised by extensive and irreversible damage. While the damage is permanent, it is nonetheless important to stabilise the disease and minimise its adverse effects. In addition to these benefits for cirrhosis, silymarin is often highlighted for its ability to regenerate the liver. It has proved to be particularly beneficial for protecting the liver from toxin-induced damage, due, for example, to pollution or ingestion of toxic substances. To maximise the benefits of silymarin, our supplement SilyPlus has been formulated from a patented form of silymarin extract called Siliphos™. This proprietary complex was specially developed to offer a highly-bioavailable form of silymarin that’s well-absorbed by the body. Silymarin in its natural state contains three antioxidant compounds but Siliphos™ features only silybin because of its superior stability and absorption by the body. It is also known to be the most active and powerful compound in silymarin. In order to further increase its absorption, silybin is combined with phospholipids, essential compounds in cell membranes. Combined in the form of phytosomes, these molecules result in a liver supplement that’s highly-bioavailable and easily absorbed by the body. Silyplus is based on a number of scientific studies and benefits from the latest formulation techniques. As such, it constitutes a high quality supplement for maintaining a healthy liver and detoxifying the body. It is formulated from the patented antioxidant complex Siliphos™, with a suggested dose of one to three capsules a day, depending on your needs. This dose can be adjusted in line with the advice of your therapist. Other ingredients: magnesium stearate, maltodextrin, silicon dioxide, microcrystalline cellulose. Each vegetarian capsule contains 120 mg Siliphos™, a silybin-phosphatidylcholine complex standardised to provide 33% silybin. Take one to three vegicaps a day, or as advised by your therapist.